Iran’s quest for the development of nuclear program has been marked by enormous financial costs and risks. It is estimated that the program’s cost is well over $100 billion, with the construction of the Bushehr reactor costing over $11 billion, making it one of the most expensive reactors in the world. 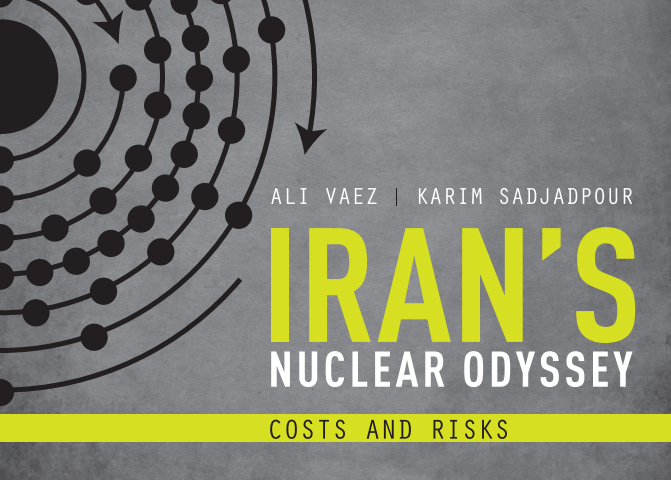 The Federation of American Scientists and the Carnegie Endowment for International Peace have released a new report, “Iran’s Nuclear Odyssey: Costs and Risks” which analyzes the economic effects of Iran’s nuclear program, and policy implications of sanctions and other actions by the United States and other allies. Co-authored by Ali Vaez and Karim Sadjadpour, the report details the history of the program, beginning with its inception under the Shah in 1957, and how the Iranian government has continue to grow their nuclear capabilities under a shroud of secrecy. Coupled with Iran’s limited supply of uranium and insecure stockpiles of nuclear materials, along with Iran’s desire to invest in nuclear energy to revitalize their energy sector (which is struggling due to international sanctions), the authors examine how these huge costs have led to few benefits. The report analyzes the policy implications of Iran’s nuclear program for the United States and its allies, concluding that economic sanctions nor military force cannot end this prideful program; it is imperative that a diplomatic solution is reached to ensure that Iran’s nuclear program remains peaceful. Finally, efforts need to be made to the Iranians from Washington which clearly state that America and its allies prefer a prosperous and peaceful Iran versus an isolated and weakened Iran. Public diplomacy and nuclear diplomacy must go hand in hand.